Violent clashes broke out at dawn Tuesday after the Israeli occupation forces (IOF) stormed Shaqba village, west of Ramallah city. Local sources said scores of Israeli troops stormed and attacked a group of Palestinian young men with flashbang grenades, whose explosion sounds caused widespread panic among children and women. No injuries or arrests took place during the events, the same sources added. Special Israeli troops had invaded the village a few days ago and kidnapped a Palestinian young man after chasing and opening fire at him. He suffered a minor bullet injury. 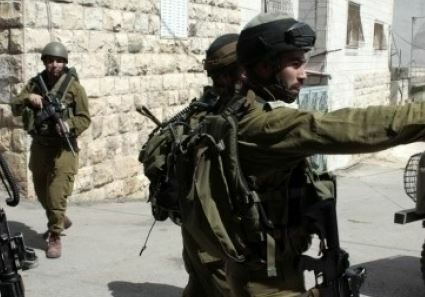 Israeli soldiers invaded on Tuesday, at dawn, different parts of the occupied West Bank, invaded and searched several homes, and kidnapped at least 10 Palestinians. Local sources in Hebron have reported that several Israeli military jeeps invaded Deir Samet town, west of the city, broke into and searched at least one home, and kidnapped Ezzeddin Jabr al-Hroub, 19. 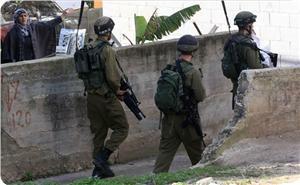 The soldiers also invaded the al-‘Arroub refugee camp, north of Hebron, and kidnapped three Palestinians. They have been identified as Ahmad Yousef Abu Naseef, Nayef al-Badawi, and Tareq Abu Sham’a. Eyewitnesses said that dozens of soldiers were deployed on the main road lining between Hebron city and various villages and towns, south of the Hebron district. The soldiers stopped and searched dozens of cars, and investigated the ID cards of the passengers. Three more Palestinians have also been kidnapped from their homes in different areas of Hebron City. 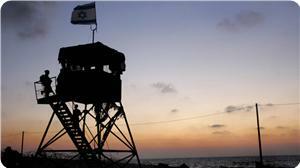 The army claims the kidnapped Palestinians are members of Hamas. 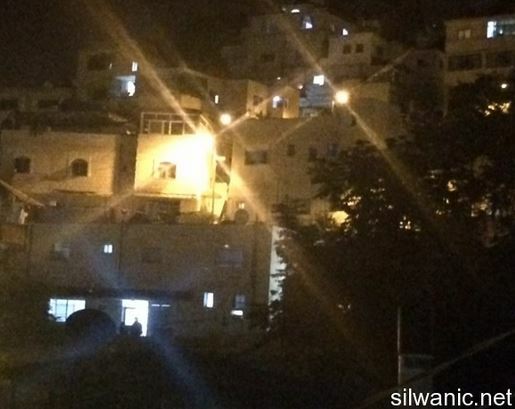 In addition, two Palestinians were taken prisoner from their homes in Husan town, west of the West Bank city of Bethlehem. Local sources said the soldiers invaded and ransacked several homes before kidnapping Ibrahim Nassar, 25, and Mahmoud Khalaf Zaghloul, 20. The soldiers also invaded the Solomon Pools area, in al-Khader town, south of Bethlehem, violently searched and ransacked several homes. On Monday evening, several Palestinians suffered the effects of tear gas inhalation during clashes with Israeli soldiers invaded Teqoua’ town, east of Bethlehem. Head of the Teqoua’ local council Taiseer Abu Mfarreh stated the clashes took place near the town council, and that the soldiers fired dozens of gas bombs and concussion grenades. Witnesses told Ma'an News Agency that five Israeli bulldozers, accompanied by Israeli forces, surrounded a five-story building in Abu Dis, post midnight, and began demolitions at around 1:40 a.m.
Muatasim Adilah, owner and lecturer at Al-Quds University, said that he and his family were ordered to leave the building without being allowed to remove any belongings. All roads leading to the building were closed prior to the operation; neighbors and local residents were not allowed near the area. Three of the five floors were destroyed, while the two remaining floors were left uninhabitable. According to the Ma'an report, Mr. Adilah stated that the first two floors were built in 1959 while affirming that an additional three floors were constructed several years ago after obtaining a license from the Palestinian Authority. Subsequently, Israel's Jerusalem municipality issued a demolition warrant for the additional three floors on April 30th of 2013, after claiming that the building is located within the municipality's boundaries. Adilah's attempt to obtain a construction license from the municipality was rejected. Clashes broke out following the four-hour demolition, and Israeli forces shot three youths with live fire, said witnesses. 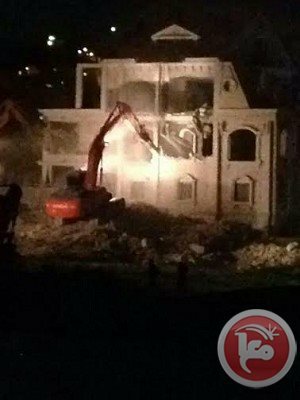 In related news, the Palestinian News Network reports that Israeli authorities distributed, on Monday, demolition notices to a number of houses in the village of Wadi Al-Nes, in south Bethlehem. Wadi Al-Nes is a village neighbouring the apartheid wall. Israel has been targeting this village for a very long time, now, by preventing inhabitants from using the historical road which connects it to Bethlehem city, following the construction of the illegal Efrat settlement. Israel destroyed more than 500 Palestinian properties in the West Bank and East Jerusalem in the year 2013 alone, displacing over 850 people, according to United Nations calculations. A 14-year-old child was injured on Monday morning when Israeli forces opened fire at a populated border area in Gaza. Spokesman for the health ministry Ashraf Qudra told Quds Press that the Israeli military watchtowers to the north of Gaza borderline opened heavy gunfire at a Bedouin village near the security fence, leading to the injury of one child. 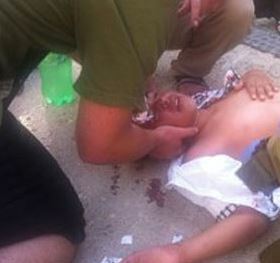 The child was rushed to Kamal Odwan hospital suffering a bullet injury in his left leg. In a similar attack, a Palestinian farmer was injured Sunday evening by Israeli gunfire in Beit Lahiya town to the north of the Strip. A number of Israeli military jeeps invaded, on Monday at dawn, the northern West Bank city of Jenin, and broke into a Coffee Shop and a Bakery. 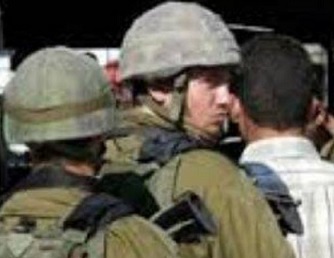 The army also kidnapped ten Palestinians in different parts of the West Bank. Local sources said that the soldiers invaded Baladna Coffee Shop, in the center of the city, and ‘Abboud Bakery, violently searching them while interrogating the workers and the customers. The invasion led to clashes between the invading soldiers and local youth, who threw stones and empty bottles at them, while the army fired gas bombs, rubber-coated metal bullets and a number of rounds of live ammunition. Soldiers also invaded Ya’bad town, southwest of Jenin, and installed a military roadblock on its main entrance before stopping and searching dozens of cars, and investigating the ID cards of the passengers. In related news, soldiers kidnapped at least ten Palestinians in different parts of the occupied West Bank, including seven in Qarawat Bani Hassan village, near the northern West Bank city of Qalqilia. One Palestinian was kidnapped in Tulkarem city, also in the northern part of the West Bank, at least one in Doura town, south of the southern West Bank city of Hebron, and two in the al-Jalazoun refugee camp, north of Ramallah. In addition, the soldiers invaded the towns of Ethna and ath-Thaheriyya, near Hebron, and withdrew after driving around for a few hours. Palestinian medical sources have reported, on Sunday evening, that a child was injured after be struck by a settler's car east of Yatta town, south of the southern West Bank city of Hebron. The sources said the child, Islam al-’Amour, six years of age, suffered a number of fractures, cuts and bruises to different parts of her body, and was moved to the al-Ahli hospital in the city. Similar to various prior incidents, the settler fled the scene. There have been dozens of similar incidents, especially since the settlers use various bypass roads in different residential and rural areas in the Hebron district. The incidents, including in other parts of the occupied West Bank, led to dozens of injuries and several fatalities among the Palestinians, including children and elderly. Also on Sunday evening, several Palestinians suffered the effects of tear gas inhalation during clashes with Israeli soldiers invading ‘Aida refugee camp, north of the West Bank city of Hebron. The clashes took place on the eastern entrance of the camp after the army invaded it, and the soldiers fired several gas bombs and concussion grenades. Several students, on Sunday, suffocated from tear gas canisters fired at them by Israeli soldiers in the village of al-Khader, to the west of Bethlehem, according to security sources. Further abductions were reported in the Jerusalem area. WAFA Palestinian News & Info agency reports that, according to the sources, forces fired tear gas canisters toward students while they were on their way home from school, causing several cases of suffocation among them. 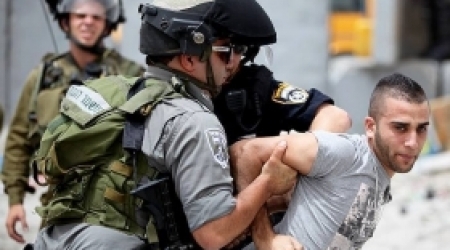 Also on sunday, Israeli police kidnapped three Palestinians in the town of al-Ezariya, to the southeast of Jerusalem, as well as served a resident living to the northwest of Ramallah a notice to appear before interrogation, according to reports by witnesses. By their account, police stormed the village, arrested three youth and led them to an unknown destination, following a raid on their homes. Meanwhile, Israeli army forces set up two checkpoints at main roads near the northern West Bank area of Jenin, intercepting and interrogating some passengers and causing a traffic jam. However, no arrests were reported. WAFA further reprots that Israeli forces stormed several villages in the Ramallah district, where they served an interrogation summons to a local resident. Forces fired tear gas canisters and stun grenades at a number of residents in the village of Surda, to north of Ramallah, causing a fire to erupt in nearby agricultural lands. Civil defense crews rushed to the scene and were able to put out the fire. This afternoon, Israeli border police entered through Salaymeh checkpoint and fired 14 tear gas grenades and one stun grenade at children leaving school. 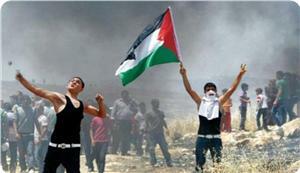 Several teenagers threw stones towards the checkpoint and the soldiers began firing tear gas. dragged him to the checkpoint, and detained him for 20 minutes. In a separate incident close by, nine-year-old Razain was walking near another local school when Israeli forces threw a stun grenade close to her legs. Shrapnel from the stun grenade injured her as it exploded in close proximity, stated Razain’s grandfather to ISM volunteers. This morning at the Salaymeh checkpoint, Israeli forces fired three tear gas grenades and one stun grenade at schoolchildren. Israeli soldiers stationed at the Gaza border shot a 22-year old farmer who was working his field, on Sunday afternoon, in an area designated by the Israeli military as a 'no-go zone', in the northern part of the Gaza Strip. Since the 50-day long Israeli assault on the Gaza Strip that ended on August 27th, Israeli forces have expanded the 'no-go zone' along the Gaza border, thus effectively annexing for Israel 40% of the remaining land area of the already extremely crowded Gaza Strip. 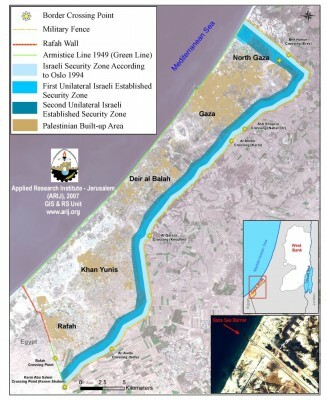 According to the initial ceasefire agreement, the 'no-go zone' was supposed to be reduced to 100 meters of the border fence and, while following the ceasefire farmers were initially able to reach their land, that soon changed, and Israeli soldiers began quickly expanding the 'no go zone', and there is no set distance where Palestinians are sure that they can be safe to farm their land. Any Palestinian who tries to farm their land or otherwise enter the 'no-go zone' is subjected to being shot by Israeli snipers stationed at the border. According to local sources, Rajab Marouf, 22, was tending his land near Beit Lahiya, in northern Gaza, when he was shot in the leg by Israeli snipers. He was taken to the Kamal Adwan Hospital, where his injury was described as moderate. The Ma'an News Agency reports that the Israeli military spokesperson told their reporters that "there were two suspects that approached the security fence", and that soldiers fired "warning shots in the air and at the lower extremities and then the suspects moved away." Wadi Foukeen is a Palestinian village just west of Bethlehem with a population of approximately 1,250 people. A weekly Friday demonstration has been organized by the village community against the Israeli occupation and in response to the recent land grab of 4,000 dunams (nearly 1,000 acres) by the Israeli government. Over a quarter of the confiscated land belongs to the village of Wadi Foukeen, which has already lost much of its land and natural resources to the constantly growing illegal Israeli settlements of Beitar Illit, Hadar Beitar, and Tsur Hadassah that surround it on three sides. Today’s demonstration began after midday prayers with a peaceful march of about 60 Palestinians, Israelis, and International protesters and media members. 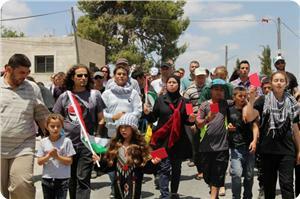 The protestors marched from the village mosque to the boundary of the illegal settlement of Beitar Illit. While many of the demonstrators chanted protest songs, waved Palestinian flags and held up signs, another group of protesters dug holes into the ground to plant olive tree saplings while soldiers forcefully tried to prevent them from doing so. The Israeli forces began to get very aggresive as they shouted at the protestors to leave declaring the area a closed military zone and threatning to use violence against the unarmed protestors if they did not comply. They began to push several Palestinian men holding signs. Without warning, the Israeli forces threw 4 stun grenades directly into the crowd followed by another 4 stun grenades. After the crowd dispersed, the Israeli forces shot several rounds of tear gas at the demonstrators. One man was hit directly in the back by a tear gas canister. Two protestors suffered from excessive tear gas inhalation and needed medical attention. After a few more minutes, the Israeli forces shot another 6 long-range tear gas canisters into the air. Soon after they began throwing more stun grenades and firing rubber-coated steel bullets directly at a group of young boys throwing small stones. One 15-year-old boy was hit in the foot by a stun grenade. Two boys were hit by rubber-coated steel bullets in their hands, a third boy was hit by a rubber-coated steel bullet in his arm, and a fourth boy was hit by a rubber-coated steel bullet in his side. All of those with injuries required medical treatment. Dozens of Palestinians suffered Saturday breathing problems after inhaling tear gas unleashed by Israeli occupation forces (IOF) during clashes in al-Khalil. According to Safa News Agency, clashes erupted when Israeli forces stormed Karaki neighborhood and started randomly firing tear gas and sound bombs. Dozens of injuries were reported. The 22-year-old Mohamed Rojbi was brutally attacked by Israeli forces during the clashes. He was transferred to hospital after suffering multiple bruises. Meanwhile, Israeli forces tightened military restrictions at the entrances to Nablus city since the early Saturday morning hours. Eyewitnesses told a PIC reporter that the IOF soldiers prevented people’s movement at Hawara checkpoint to the south of the city. The sources added that Palestinians’ vehicles were stopped and searched at the checkpoint which led to a traffic jam. The Israeli occupation forces (IOF) on Friday violently attacked several peaceful marches organized weekly in different West Bank areas to protest settlement activities. Following the Friday prayers, the IOF fired a hail of tear gas grenades and rubber bullets at Palestinian and foreign protestors in Nabi Saleh village, west of Ramallah, according to local sources. A number of young protestors suffered tear gas injuries as they were marching towards annexed Palestinian lands near Halamish settlement in the village. Consequently, violent clashes broke out between dozens of young men and Israeli soldiers, especially at the eastern entrance to Nabi Saleh village. Human rights activist Bilal Tamimi said the march was dedicated this Friday to advocating the Palestinian unity and national coherence in the face of the Israeli occupation. In Bil'in village, the IOF subdued Palestinian protestors and foreign activists participating in the weekly anti-wall march. The participants started their march chanting slogans calling on the Palestinians to unite against the occupation and adhere to the Palestinian constants. As the protestors reached Palestinian lands threatened with annexation to Kiryat Sefer settlement, Israeli soldiers started to intensively fire tear gas grenades and rubber bullets at them. Many suffered injuries during the confrontations. 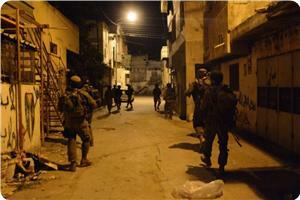 In Bethlehem, violent clashes broke out in Wadi Fukin village between Israeli troops and Palestinian citizens. Head of Wadi Fukin municipal council Ahmed Sukar said that a number of citizens peacefully marched from outside the only mosque in the village following the Friday prayers to annexed Palestinian lands in Khamsa and Kanisa areas to the east. Sukar added that the IOF showered the protestors with tear gas and stun grenades and clashed with them after they were able to plant dozens of seedlings in the annexed area. Similar events also happened during the weekly march of Kafr Qaddum village near Nablus after the IOF attacked the protestors with tear gas. The residents of Kafr Qaddum organize weekly protest marches against Israeli settlement expansion and the separation wall. The Israeli occupation forces (IOF) at dawn Friday raided Palestinian homes in Burin town south of Nablus after they had established makeshift checkpoints last night. Bystanders at the scene said large numbers of Israeli troops broke into and ransacked several homes in the town, including the house of Palestinian citizen Brusli Dakhil. Dakhil said the soldiers occupied his house for long hours and made verbal threats against Burin residents at the pretext of hurling stones at settlers’ vehicles. Earlier on Thursday, the IOF set up two checkpoints between Badhan and Fara’a towns to northeast of Nablus. Eyewitnesses said the roadblocks caused a traffic jam, especially since thousands of Palestinian students and employees were on their way back home after leaving their schools and workplaces in Nablus city. 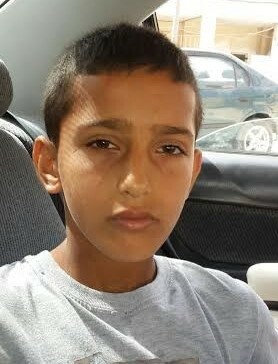 The Israeli occupation forces (IOF) arrested 11-year-old Mohamed Zagal near Bab Al-Asbat neighborhood in east Jerusalem after eight Jewish settlers tried to assault and kidnap him. The child's father told Wadi Hilweh information center that his son Mohamed was en route to home in Ras al-Amoud neighborhood after he escorted his sister to her school. When he reached Al-Ghuthmaniya road, the father added, eight settlers chased him until he managed to hide in a car belonging to a Palestinian family, but as some citizens in the area tried to fend off the Jewish assailants, Israeli policemen showed up and arrested his son on allegations of throwing stones at the settlers. The father affirmed that the Israeli police refused to listen to his son, who accused the settlers of attempting to kidnap him, and detained him for interrogation and threatened to arrest him if such incident happened again.